I thought it would be fun to post a little “gift” every Friday…..a recipe, a fun website, a cool craft tutorial, etc. Something fun to get the weekend started! Today’s “gift” is this recipe for David Eyre’s Pancake Recipe from 1966 (with some changes/additions I have made). 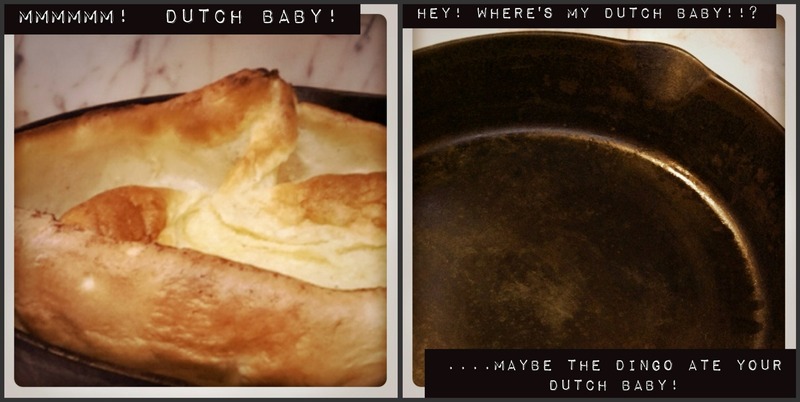 Variations and names abound – Dutch Baby, German Pancake, or David Eyre’s Pancake – call it what you will, just be sure to try it! It looks tricky but is the easiest thing in the world – I make it for my daughter before school, if that gives you any idea about the ease of making this dish! It takes about 5 minutes to make and 20 minutes to bake – and works every time! Be sure to scroll down for single serving ingredient measurements, other ways to serve it, and links to the original recipe! Heat oven to 425 degrees. 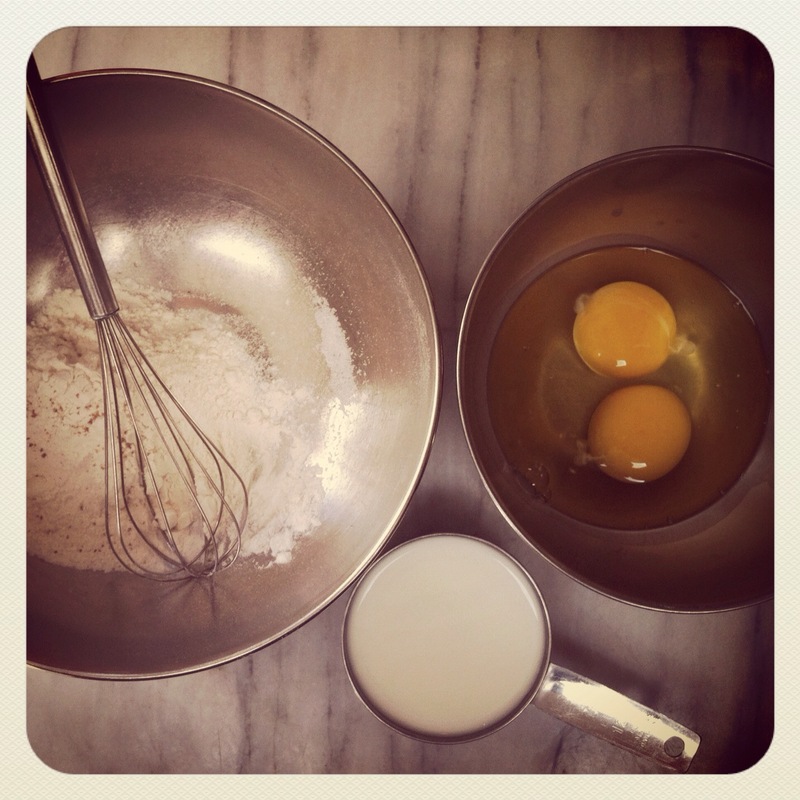 Combine the flour, milk, beaten eggs, and nutmeg in a bowl. Beat lightly with a whisk. Leave the batter a little lumpy and let rest for 5 minutes. 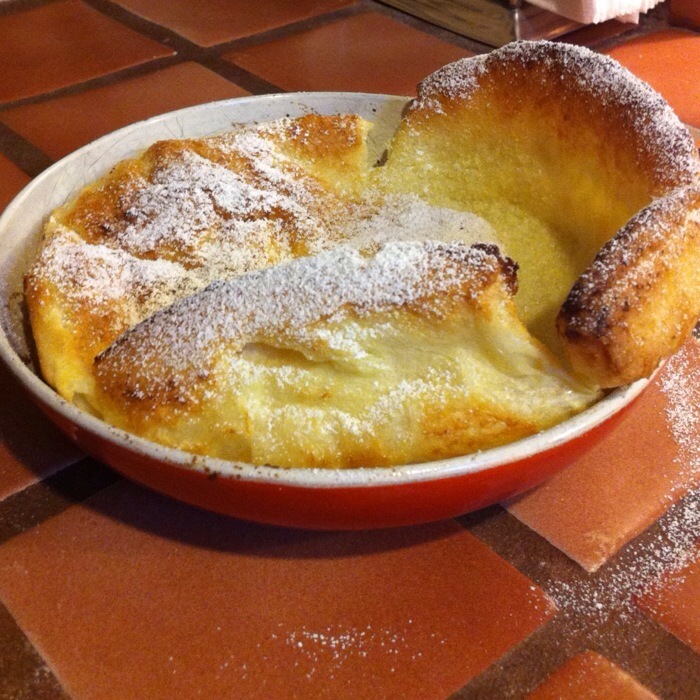 While the batter is resting, put 2 Tbs butter in a 12′ heatproof skillet and put skillet in oven for 3-5 min. – check at around 3 min. to make sure butter is not burning. When the skillet is very hot, remove from oven (careful! ), swirl butter around bottom to coat and pour in the batter. Bake for 15 to 20 minutes, until the pancake is golden brown. Sprinkle with the sugar and lemon juice, and serve with jelly, jam. After the pancake has been baked, add anything you would add to an omelet (shredded ham, mushrooms, spinach, etc) and a bit of shredded cheese to half of the pancake. With a spatula, fold over the other half and let it sit for a few minutes to allow the cheese to melt – or put it back in the still warm oven for a couple of minutes. Cut into wedges and serve with a simply dressed spinach salad. 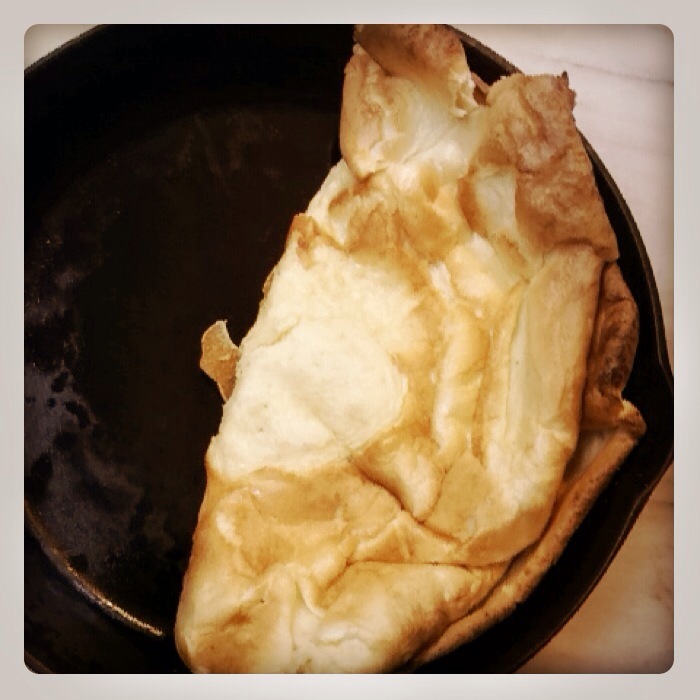 Served this way, a pancake made in a 12″ skillet will serve three people. Links to the original recipe and a history of the family recipe from David Eyer’s daughter! 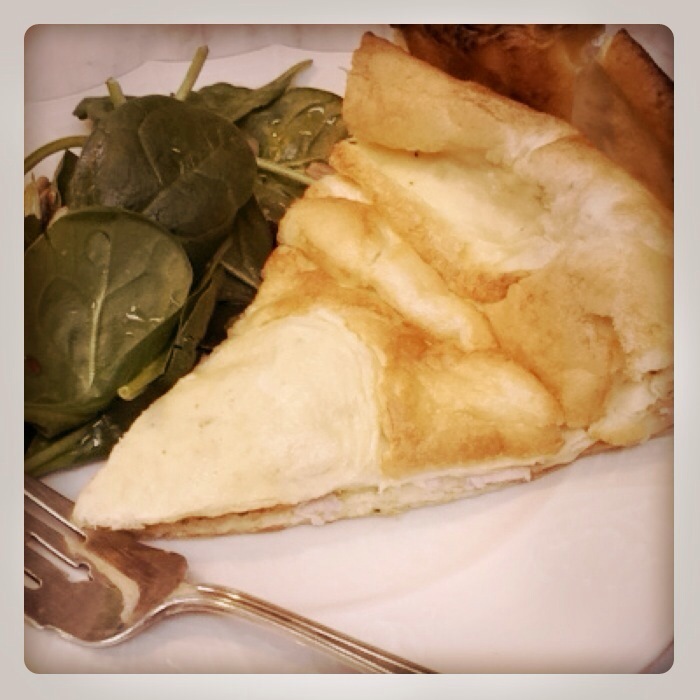 David Eyer’s Daughter’s Note – be sure to read this; it is so touching and provides a wonderful context for this recipe! You will think of it each time you make this! « Older Post How to waterproof your Laptop ….ALMOST! » Newer Post POP-UP OFFICE!